What's new in CE/DP Stealer 6? The new CE/DP Stealer 6.0 works great with Live Messenger 8, allowing you to steal display pics, icons, animations, blog pictures and more! 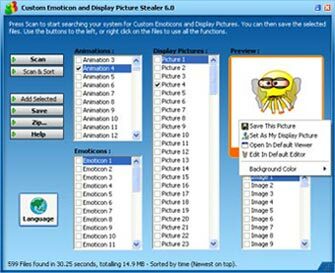 The scanning process has been improved, becoming fast and providing better detection of animations and animated smileys. Two of the most frequently requested languages translations have been added: Arabic and Turkish are now fully supported! Finally, with the upcoming Windows Live Messenger 8.1 finally adding support for the Thai language, we've decided to do the same by adding full support for the Thai language in CE/DP Stealer 6.0! To find out more about CE/DP Stealer, you can visit the CE/DP Stealer page.